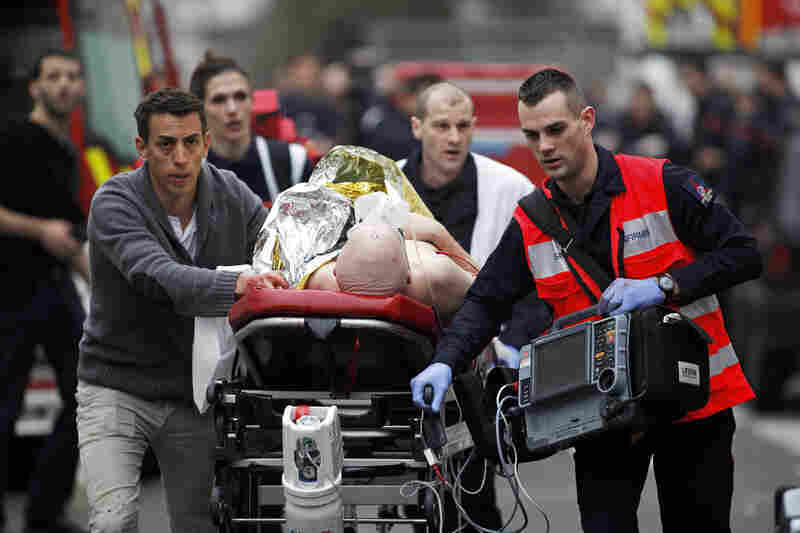 At Least 12 Die In Shooting At Magazine's Paris Office; Suspects Named : The Two-Way President Francois Hollande said this was a "terrorist operation." Back in 2011, Charlie Hebdo printed a drawing of the Prophet Muhammad. Its office was destroyed by a firebomb. 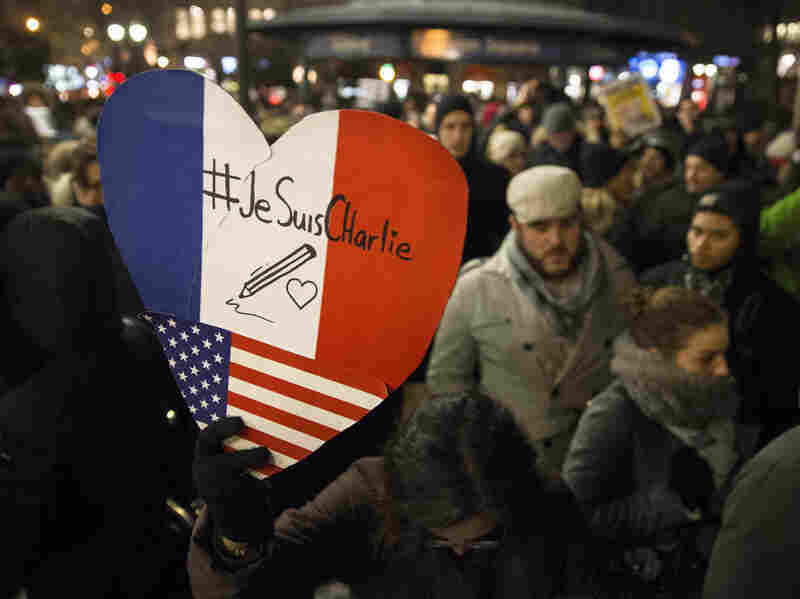 Mourners attend a rally Wednesday night at Union Square in New York City in support of Charlie Hebdo, a French satirical weekly newspaper that fell victim to a deadly terrorist attack earlier in the day. 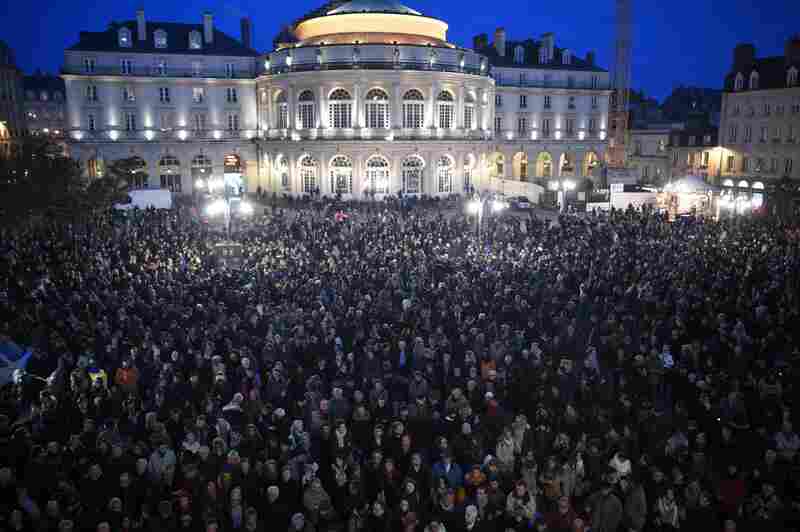 People gather in front of City Hall in Rennes, western France, in a show of respect for those slain Wednesday in an attack on the headquarters of the French satirical magazine Charlie Hebdo. At least 12 people were killed, according to police. 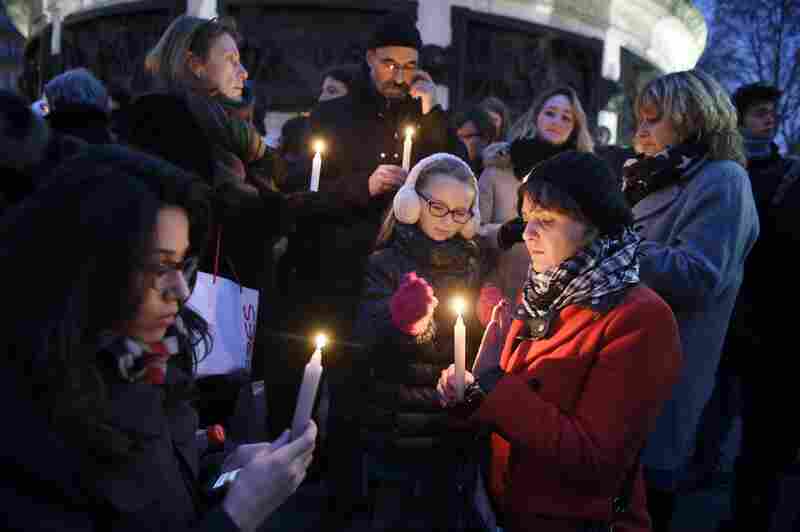 People light candles during a vigil at the Place de la Republique in Paris. French President Francois Hollande declared Thursday a day of mourning and asked the French to hold a minute of silence at noon. Papers reading "Je Suis Charlie" — "I am Charlie" — are left near candles at a vigil in front of the French Embassy in Berlin. 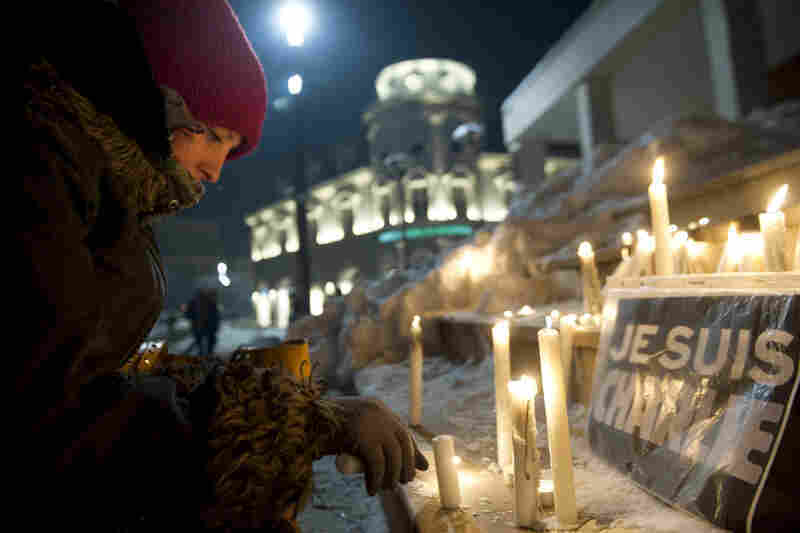 A Kosovo Albanian woman lights a candle next to an "I am Charlie" sign during a gathering in Pristina. 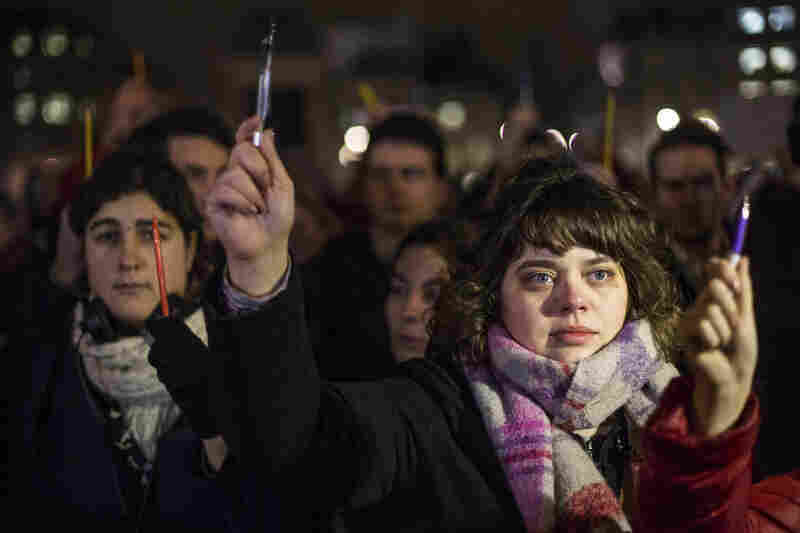 People hold pens during a vigil in London's Trafalgar Square. 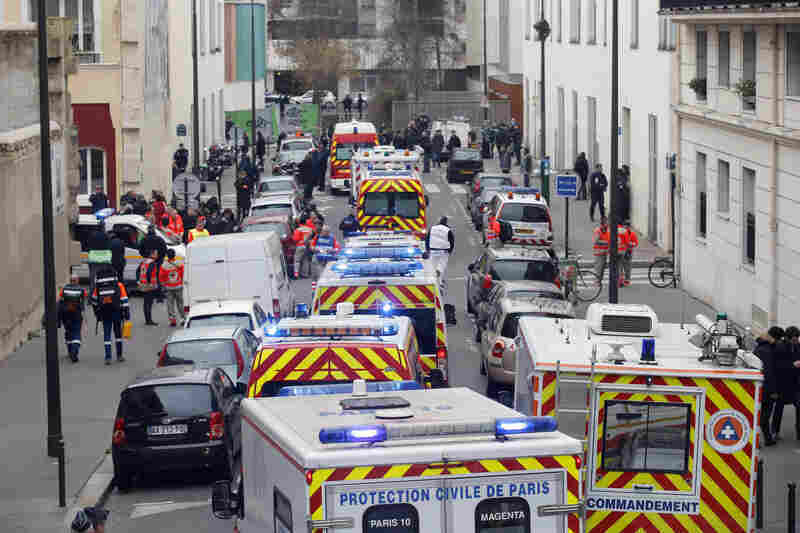 Ambulances gather in the street outside the Charlie Hebdo office in Paris. Hollande promised that "everything will be done to capture the perpetrators" and bring the gunmen to justice. Forensic experts examine a car believed to have been used as an escape vehicle by the assailants. Four of the magazine's founding cartoonists were killed in the attack, according to French news outlets. Eleven other people were injured, four of whom are in critical condition. 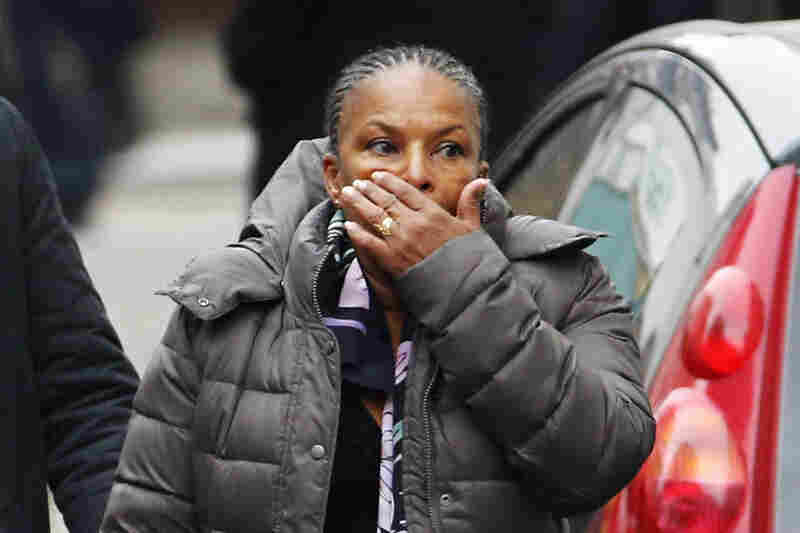 French Justice Minister Christiane Taubira reacts to the scene after the attack. An injured person is evacuated outside the office. In 2011, Charlie Hebdo was the target of a firebomb attack after it printed a drawing of the Prophet Muhammad. French soldiers patrol in front of the Eiffel Tower. The capital was placed under the highest alert status following the attack. 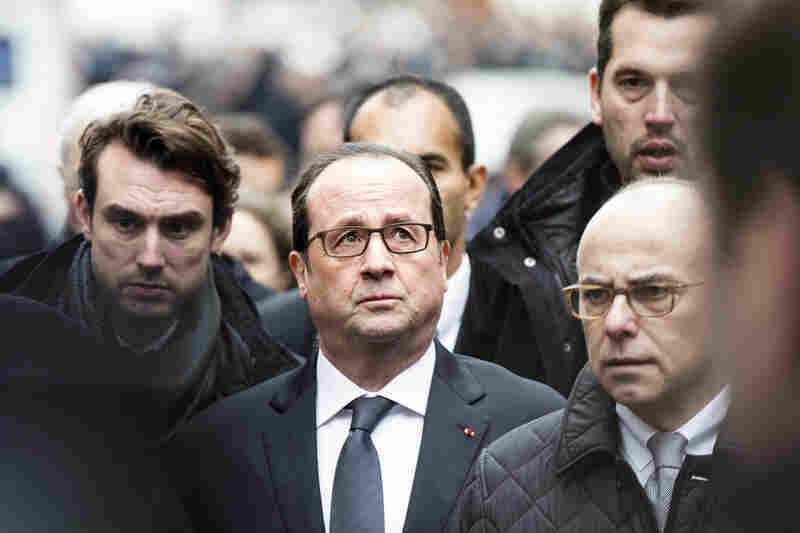 "France today faced a shock," Hollande (center) said, according to a BBC interpreter. "Today, I'm thinking about the victims." 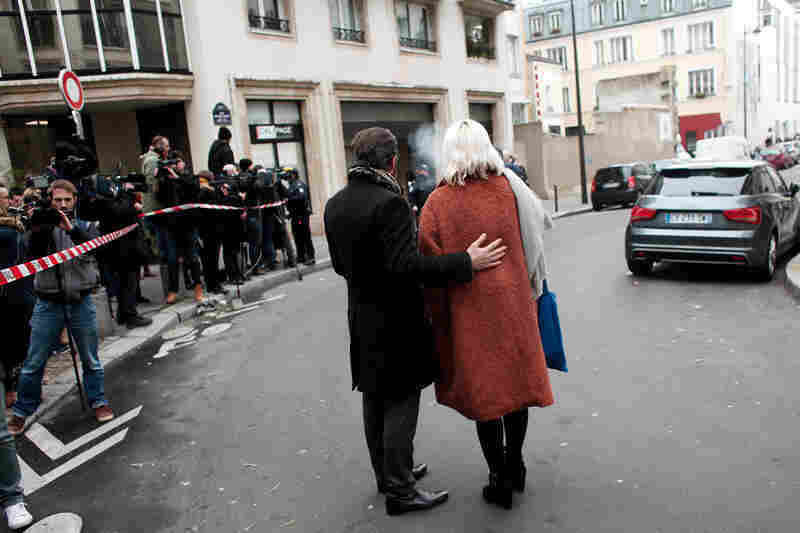 People stand outside the Charlie Hebdo office after the attack. NPR's Eleanor Beardsley says it's unclear how the gunmen managed to get past extra security, which had been put in place because of previous threats. The authorities had been hunting three suspects in the attack; they were reportedly identified by police late Wednesday, and multiple French media outlets, citing a police bulletin, say they are two brothers, Said and Cherif Kouachi, and a third man, Hamyd Mourad. The Kouachi brothers, both in their 30s, are said to be French citizens; there's no word on the nationality of Mourad, 18. Mourad surrendered to police late Wednesday, according to multiple reports in French media. It's not clear whether he had a role in the violence; Mourad's ID card was reportedly found in a car the gunmen used. Police have conducted operations related to their investigation in Paris as well as Reims, some 90 miles to the east. Speaking to reporters at the scene of today's attack, President Francois Hollande said this was a "terrorist operation" in which journalists were "cowardly assassinated." "France today faced a shock," Hollande said, according to a BBC interpreter. "Today I'm thinking about the victims." Many in France gathered in the streets Wednesday evening, holding up signs reading "Je Suis Charlie" — I Am Charlie — in a show of respect toward those slain and defiance toward the attackers. "There is a feeling of togetherness," says NPR's Eleanor Beardsley, who visited a large vigil at the Place de la Republique. 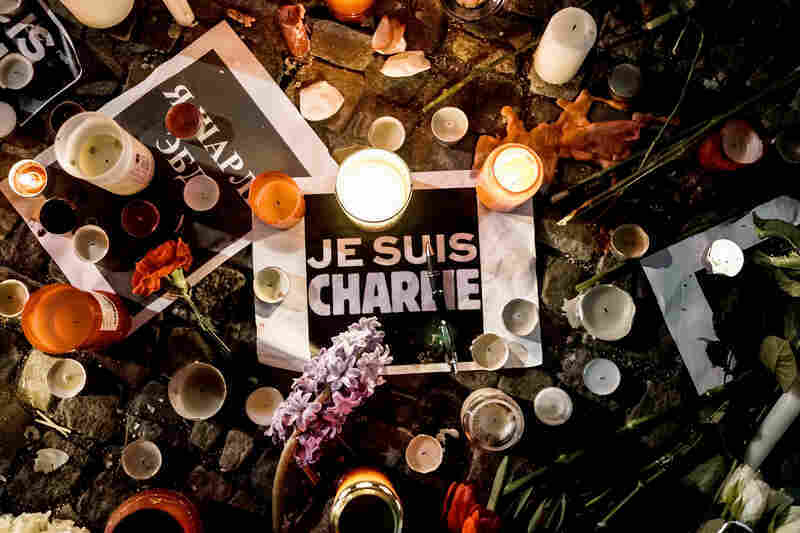 "Everyone out there was chanting, 'We are all Charlie.' "
Similar gatherings are being held outside the country — including in Germany, Britain, and the U.S. The phrase also became a top-trending hashtag on Twitter. Several large French media companies united to send a letter of support to Charlie Hebdo's staff, offering to help them continue publishing and stressing the importance of "preserving the principles of independence and liberty of thought and expression." 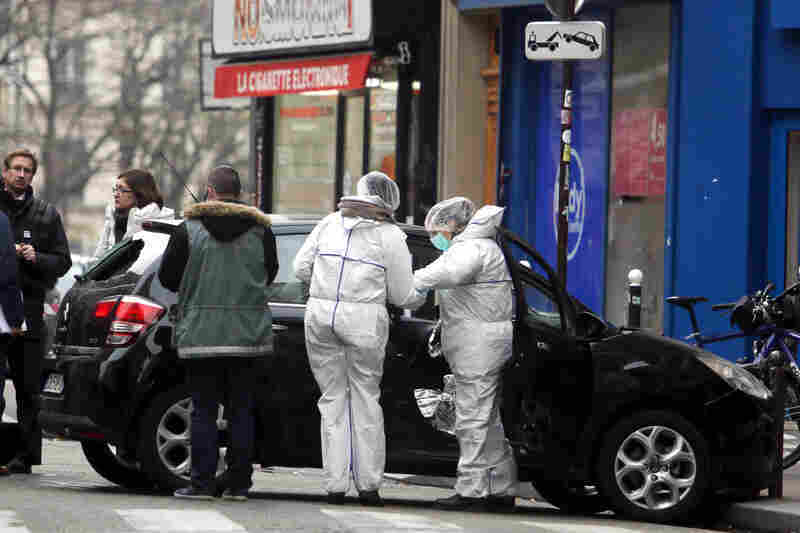 In a televised briefing, Paris Prosecutor Francois Molins said "at least two" gunmen entered the offices of the magazine at about 11:30 a.m. on Wednesday, Paris time. Eleanor reports that the men first shot and killed a police officer stationed at the magazine, then walked up to the second floor newsroom and opened fire. Four of the magazine's founding cartoonists were killed in the attack. Eleven other people were injured, four of whom are in critical condition. One video broadcast on French television shows two masked men leaving the building and then trading fire with a police officer. The officer is injured and one of the men stands above him and kills him at point-blank range. Eleanor says during the exchange, one of the men shouts, "We have avenged the Prophet Muhammad." The gunmen then got into a black vehicle to escape. They went to a Paris suburb where they abandoned their car and jumped into another. A massive manhunt ensued in the Paris area, with some school trips canceled and some metros closed. 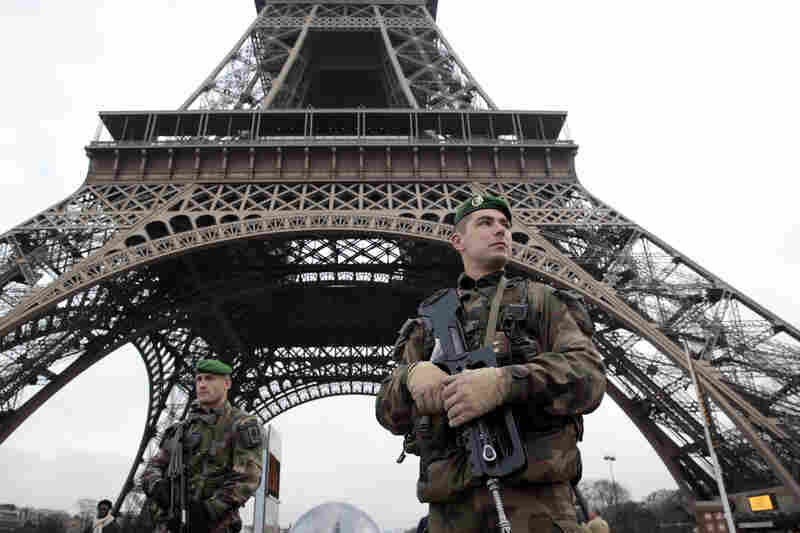 France has also beefed up its security, which Hollande said would help apprehend those who perpetrated the attack. Charlie Hebdo is a magazine that has faced threats over its content in the past. Back in 2011, the weekly printed a drawing of the Prophet Muhammad. Afterward, its offices were destroyed in a firebomb attack. Multiple French media outlets, citing a police bulletin, say the suspects are two brothers, Said and Cherif Kouachi, and a third man, Hamyd Mourad. The Kouachi brothers are believed to have been born in Paris. According to journalist Elijah J. Magnier, one of the men left his ID card in a car they abandoned today. "Cherif Kouachi was convicted in 2008 of terrorism charges for helping funnel fighters to Iraq's insurgency and sentenced to 18 months in prison. During his 2008 trial, he told the court he was motivated by his outrage at television images of torture of Iraqi inmates at the U.S. prison at Abu Ghraib." French police have reportedly identified the suspects in Wednesday's attack. And filling in a key detail that has been in flux today, the authorities say they've been hunting three fugitives (some earlier reports had cited two gunmen). News outlets in France and the AP are reporting those developments. We're also seeing reports that police actions related to the investigation have been carried out in two cities east of Paris — Reims and Strasbourg — as well as in areas around the capital city. In an interview with Radio France, Philippe Val, the former director of Charlie Hebdo, said he had lost all his friends today. "Our way of rendering justice is to not to stand by quietly; it is to continue," he said, holding back tears. "One cannot do otherwise. I hope that this tragedy, which is irreparable, will change things, that we will not let the bastards win. It is necessary to have a forceful and realistic discussion on this rising danger, which is real and that has been denounced for years. We have not listened. Today you have to listen to us, do not leave us alone." He said this attack is not only an attack on Paris but also an attack on people who hold core values — like free expression and a free press — dear. Molins said at the moment authorities are still looking for the men and the French anti-terrorism unit has been mobilized. Earlier today, French Interior Minister Bernard Cazeneuve said the attack was perpetrated by three gunmen. We've tweaked the language in this post to reflect the information presented by Molins. According to France 24, The New York Times, The Wall Street Journal and USA Today, the top editor at the newspaper, Stephane Charbonnier, was killed during the attack. "A lawyer for the newspaper said that a number of prominent editors and cartoonists had been killed on Wednesday, including the cartoonists Stephane Charbonnier, known as 'Charb,' and Jean Cabut, who signs his work 'Cabu.' He said that the cartoonists Georges Wolinski and Bernard Verlhac were also among the victims." He told Le Monde that Charlie Hebdo would continue doing what it's always done. "It's perhaps a bit pompous, what I'm about to say, but I would rather die standing than to live on my knees," Charbonnier told the paper. Charbonnier's last drawing featured a shabby-looking militant. It said, "Still no attack in France." The militant responds, "Wait! We can send best wishes until the end of January." Parisians will march at the Place de la Republique for "freedom of the press, democracy, and the Republic." Meanwhile, on the Internet, Twitter has been inundated with posts tagged with #JeSuisCharlie, or I am Charlie. "Today's murders are part of a larger confrontation," Kerry said, "between civilization itself and those who are opposed to a civilized world." Despite today's attack, Kerry said, civilization — with its core values of freedom of expression and a free press — will prevail. "In an international context of political tensions fueled by delusions of terrorist groups taking advantage unfairly of Islam, we call on all those committed to the values ​​of the Republic and democracy to avoid provocations that only serve to throw fuel to the fire," the group said. Faced with this tragedy, "we call the Muslim community to exercise the utmost vigilance against possible manipulations from groups referred to as extremists of any kind." "France is America's oldest ally, and has stood shoulder to shoulder with the United States in the fight against terrorists who threaten our shared security and the world. Time and again, the French people have stood up for the universal values that generations of our people have defended. France, and the great city of Paris where this outrageous attack took place, offer the world a timeless example that will endure well beyond the hateful vision of these killers. We are in touch with French officials and I have directed my Administration to provide any assistance needed to help bring these terrorists to justice." "All means will be carried out ... in order to ensure as quickly as possible that we can identify the actors and arrest them so they are punished," Cazeneuve said, according to a translation by CNN. In January 2013, Charlie Hebdo published what it called "The Life of Muhammad." According to the magazine editors, this was a nonsatirical look at life of the prophet. But others took umbrage.
" 'To transform the life of the prophet of Islam into a cartoon is in itself a mistake,' Ibrahim Kalin wrote on his Twitter account.
" 'Whatever the people at Charlie Hebdo say, this is a provocation.' "
Charlie Hebdo's last tweet, by the way, showed a cartoon of Abu Bakr al-Baghdadi, the leader of the so-called Islamic State. Video being broadcast on French television shows a chaotic scene as people reacted to shots being fired in the middle of Paris. One video shows two masked gunmen trading fire with a police officer. The officer is injured in the exchange, falls to the ground, and then one of the gunmen stands above him and shoots him at point-blank range. The gunmen then jump into a black car to get away. If you're interested, France 24 has live, English-language coverage of the shootings. That's the word from NPR's Eleanor Beardsley, who is now at the site of the shooting. Eleanor says that because of previous threats, the magazine's offices were protected, but it's not clear how the gunmen managed to get past the extra security. She describes Paris as being in shock. She says people from nearby office buildings have gathered just outside the police cordons trying to make sense of what just happened. During a press conference, President Francois Hollande said the country had raised its security profile to apprehend the people who perpetrated the attack. Hollande said that police had thwarted other terrorist plots in recent weeks.